This story was written by CBS News producer Alfonso Serrano F.
Budweiser beer may be royalty in American bars, but it's getting no respect in the land of Oktoberfest. As one of seven U.S. sponsors at this summer's World Cup in Germany, Anheuser-Busch paid $40 million for "pouring rights" at 12 stadiums across Germany, something Germans and tourists have had trouble swallowing. 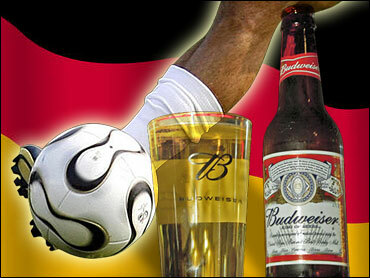 Simply put, Germans hate Budweiser. Weeks before the inaugural games kicked off the Cup, Germans were furious at the prospect of having to drink what they refer to as "dishwater" at stadiums. Germans even set up a Web site with an image of an American Eagle vomiting beer to lampoon the American brewer and express their disgust. "Human dignity is inviolable," reads the Web site, quoting the German constitution. The Web site goes on to call Budweiser "an insult to all true beer lovers" and an "insult to your tongue." Soccer's governing body — the Federation Internationale de Football, or FIFA — did little to improve Budweiser's standing when it forced thousands of Dutch fans to watch the first round Holland-Ivory Coast game in their underwear. Close to a quarter million Dutch fans have purchased orange-colored shorts to support their team, shorts that carry the logo of the Dutch beer, Bavaria. In a contentious move to protect Budweiser's rights, FIFA officials forced Dutch supporters to remove their shorts. "It's ridiculous," said Sjoerd Schreurs, a Dutch fan quoted by The Guardian in London. "I took my trousers off. I managed to chuck them over the fence to some friends. But another official spotted them and took them away." The World Cup is a marketer's dream. More than a billion people watched the 2002 World Cup final between Brazil and Germany. FIFA says 32 billion cumulative viewers will watch this year's month-long tournament, with an estimated audience of 350 million for each match — numbers that dwarf the 95 million viewers worldwide who watched the 2006 Super Bowl. These titanic international audiences are the reason companies will spend $1 billion in advertising before the tournament's end. Budweiser is expected to spend $70 million in advertising and marketing, more than it spends on the Super Bowl and the Olympics. "For us it's the No. 1 beer consumer event in the world," said Tony Ponturo, vice president for global media and sports marketing at Anheuser-Busch. Ponturo pointed out that Anheuser-Busch has been a World Cup sponsor since 1986 and that it markets heavily at the event, whether it's held in France, Korea or Germany. But denting the German market has been a royal pain for Budweiser. A Beer Purity Law established in 1516 — it limits beer ingredients to yeast, water, barley and hops — was watered down in the late 1980s, allowing the sale of Budweiser through a loophole for import beers (rice is a key ingredient in Budweiser). Various legal challenges kept Budweiser out of Germany until 1996. Even then, Budweiser could only be sold as "Anheuser-Busch Bud," so it would not be confused with the popular Czech beer Budweiser Budvar. In an effort to appease German drinkers, Budweiser made a deal to allow the German-made Bitburger beer to be sold in stadiums, albeit in unmarked cups. Ponturo said Budweiser is out-selling Bitburger at a 70- to 30-percent rate. Ponturo pointed to an extremely competitive beer market in Germany, where there are over 1,200 breweries, and where Budweiser represent less than 1 percent of market share in Germany. "It's difficult for even German beers to grow in certain areas of Germany because there are so many local beers," said Ponturo. "There are so many options, and they take pride in that."